Let’s face it: some people like one space at the end of a sentence, and other people like two. (And some one-space people love to bash two-space people, and vice-versa—but that’s another story.) Fortunately, Word is not a program that enforces a single space after sentences when you may want to use two. On the other hand, if the end of your sentence falls at the end of a line, one of your spaces may stay on the first line, and the second space may wrap to the second line. This can mess up the appearance of your page. The first thing to do is to ensure that the extra space is really wrapping to the next line. If you have non-printing characters turned off (so they are not visible), it is very easy to mess up the formatting of a document. For instance, you may think you have two spaces at the end of a line, but you really have a single space, followed by a hard return, and then the new line starts out with a space. To check for this, just click on the Show/Hide tool on the Home tab of the ribbon (it looks like a backwards P) and see if a hard return is at the end of the line. 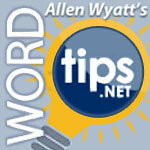 WordTips Microsoft Word, wordtips. permalink.